The women’s track team is hoping to start off the season a little better than it ended it last year. Last year the team ended the season with a 14th place finish at State, which is not what it was hoping for, but the youthful contributions of four freshmen and six sophomores pointed to a bright future. Another positive thing that happened for the team at State last year was that seven girls picked up all time personal bests, and four relays earned their fastest times of the year; 16 of these athletes are returning for this season. Head coach Don Williams loves to see the growth of each athlete as the year rolls on. “My favorite part of coaching track is a toss up between watching these girls gain confidence as they improve while learning to love the sport followed by a close second, [which] is hearing from girls who have been out of school [for] a while about how much they learned about life [while] participating in high school athletics at CF,” Williams said. Although there are many seniors on the team, one specifically will be running next year at Central College. 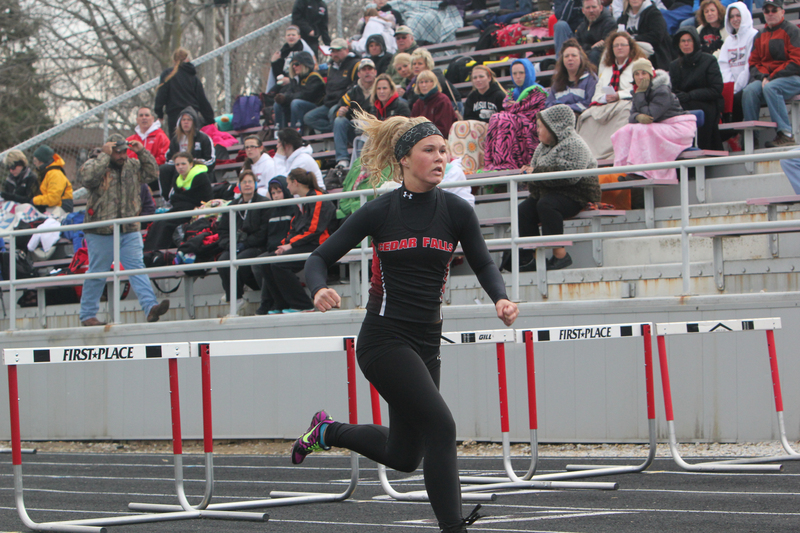 Senior Maddie Smith runs the shuttle hurdle relay, open 100 hurdles, sometimes the four by one and sometimes the four by three. “I am going to miss how much fun we have at meets, and I will miss state track the most. It is always a really fun weekend where your team gets to bond and have fun. My goal is to qualify for the state meet, so I can enjoy it for the last time ever,” Smith said. The team’s goals for this season are to improve its standing at State. It also wants to be a top contender in the Mississippi Valley Conference, which includes Cedar Rapids, Dubuque, Iowa City and Waterloo schools. The Tigers also want to, “establish a tradition of excellence in all venues, throwers, jumpers, sprinters, hurdlers and distance, and to continue to improve on everyone being more encouraging to everyone else on the team,” Williams said. The team’s next meet is on Saturday, April 5, in Cedar Rapids.